Brightpearl is your central order processing system for all your integrated sales channels. All orders from ekmPowershop need to be processed through fulfillment and shipping in Brightpearl (or via your shipping application). As these processes are completed Brightpearl will update ekmPowershop order status to "Dispatched". Important : Ensure that you have an order status in ekmPowershop called "Dispatched". Once the order is shipped in Brightpearl a message will be sent to ekmPowershop to update the order status to "Dispatched". If it does not exist the order status will not be updated. If you are using a shipping application other than ShipWorks or ShipStation please let us know and we’ll discuss other options. Fulfillment is the process of creating the goods-out note for an order. This can be done one order at a time, or in batches. The goods-out note is the document which will be sent with the order. Often this will be printed onto paper with the customer’s delivery address positioned a sticky label which can be placed on the front of the package. Alternatively it can be folded up and placed in a plastic wallet, carefully ensuring the customer’s delivery address is at the front so it can be secured to the front of the package. Your goods-out note is created in Brightpearl using a template. This might be same one you use for all your orders, or it might be a special design specifically for a orders from a particular ekmPowershop account, including using a different logo if desired. ekmPowershop allows order lines to be shipped separately, but not partial lines. This means you can use partial shipment in Brightpearl on ekmPowershop orders, but only to ship whole lines. If a line is part shipped in Brightpearl the whole line will be marked as shipped in ekmPowershop, confusing your customer when they receive only some of the items. ekmPowershop orders cannot be split to back orders. The back order would not reflected in ekmPowershop and would not be connected to the ekmPowershop order. Only the downloaded order is connected and once it is shipped the ekmPowershop order will also be marked as shipped, even the items that are no on a separate back order. For these reasons back orders should not be used on ekmPowershop orders. As soon as the order is marked as shipped in Brightpearl it signals that the items have left the building and so the in stock figure is reduced. This has no effect on the availability on ekmPowershop since it is the on-hand level that is synchronized; this was reduced as soon as the order was downloaded and the inventory allocated. The order shipping status is updated in Brightpearl and in ekmPowershop. In ekmPowershop the order is marked as “shipped” which can be set to automatically email the customer to let them know their order is on the way. (When using cost of sales accounting only) Since the items are no longer in stock your inventory asset value must be reduced and the cost of sales recorded. Each time a product is marked as shipped in Brightpearl the order is also updated in ekmpowershop, however, bundles and line items which have been manually edited on the order in Brightpearl will be updated only once the order is fully shipped in Brightpearl. Bundle items in Brightpearl are non-stock tracked and are therefore not ever marked as shipped - it's only the items within the bundle which are shipped. Since the items within the bundle are not directly connected to ekmPowershop the shipping update can not be made in the same way as individual items. If line items are edited on the order in Brightpearl the connection to ekmPowershop is lost, so shipping those items will not update ekmPowershop. The "fully shipped" update will ensure these items are marked as shipped on ekmPowershop. Tracking references cannot be uploaded to ekmPowershop as they do not have a field for it. The shipping method is provided by the ekmPowershop account and is assigned to the order in Brightpearl as long as a shipping method of the same name exists. 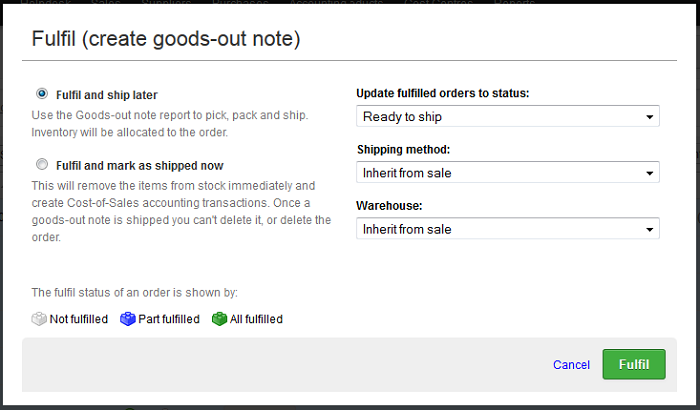 Prioritize shipping by shipping method before or after fulfilling orders to goods-out notes by using the filters on the sales or goods-out notes lists. Shipping charges are added as line items and are downloaded from ekmPowershop, they are not applied by Brightpearl. Brightpearl allows you to send an email to the customer when the goods-out notes is packed. ekmPowershop can also automatically send an email to the customer when the order is updated to shipped. Choose the option suits your own processes best. Do consider that sending too many emails might be a nuisance to your customers. You may be using a shipping system such as ShipStation with your ekmPowershop account already. When you connect ekmPowershop to Brightpearl, you will need to change your processes. You’ll need to fulfill orders in Brightpearl. This will create “goods out notes” which are then transferred to your shipping system from Brightpearl. Your shipping system will tell Brightpearl that the goods-out note has been shipped, and then Brightpearl will tell your ekmPowershop account that the line items have been fulfilled (note that tracking references are not sent to ekmPowershop from Brightpearl). The integration supports partial shipment of an order, so you can send different lines in different shipments. In Brightpearl, search for and open the order. 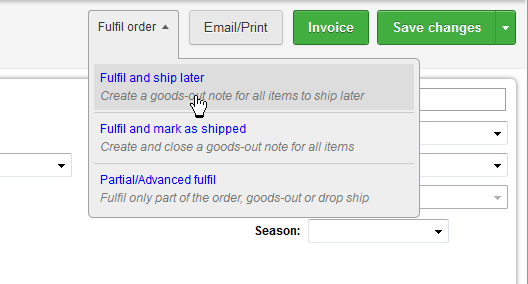 Hover over Fulfill order at the top of the order and select Fulfill and ship later . The goods-out note is created and the reference is displayed. Click on the reference to view the document. In Brightpearl, go to Sales > Recent Sales/Quotes . Use the filters to search for the orders to be fulfilled. Select one or more orders to be fulfilled. Click the Fulfill button at the top of the list. Select Fulfill and ship later . (Optional) Choose which status to place these orders on. (Optional) If you want to apply a different shipping method than entered on the order records, change it here. (Optional) To override the warehouses used on the orders, select one here. Click the Fulfil button to create your goods-out note(s). Before you can perform these steps you will need to have created a goods-out note, this is done with a process called Fulfillment. Click on the goods-out note reference (find it against the fulfilled line items) to display the document. (Optional) Print the goods-out note. (Optional) Mark the goods-out note as picked . (Optional) Click to Pack the goods-out note. At this stage a tracking reference and final shipping method can be entered.Tracking references will be sent to the relevant sales channel if relevant. Emails and SMS can be sent to the customer to confirm the order is being dispatched, but this may already be handled by an integrated application, so decide which one will be used. Finally, mark the goods-out as shipped . The goods-out note can now be closed. In Brightpearl, go to Sales > Goods-out notes - due to ship . Filter the list to the relevant warehouse. (Optional) Click to print the documents. (Optional) Select the goods-out note again, and click Pick . This will display a picking list for those orders. (Optional) Select the goods-out notes and mark them as packed . A tracking reference can be entered and, if it has since changed, the final shipping method (for reference in Brightpearl only). Emails and SMS can be sent to the customer to confirm the order is being dispatched. Note : If the order is from an integrated sales channel, check your automatic email settings in your seller account. Finally, select the goods-out notes and mark them as shipped . 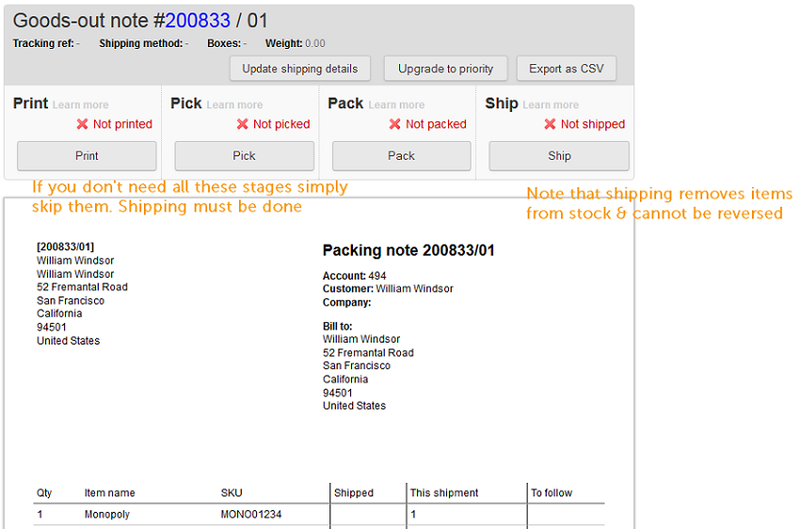 Shipping the goods-out note will update the order shipping status, remove the items from inventory and post the relevant cost of sales accounting for inventory. Shipping cannot be reversed. If the order was received via an integrated sales channel the shipping confirmation and tracking reference will now be uploaded to that channel. Search for and open the order. 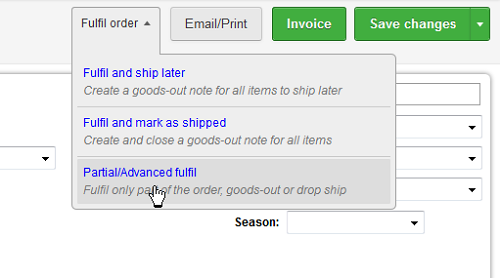 Hover over Fulfill order at the top of the page and select their third option Partial/Advanced fulfill . Specify how many items are to be sent in this first shipment. Enter zero if none are to be sent. Select the warehouse the items are to be shipped from (each different warehouse selected creates a separate shipment/goods-out note). (Optional) Select a shipping method to assign to the goods-out notes, or leave it blank to apply the order shipping method. Click the Create Purchase Orders / Goods notes button. The goods-out note will be displayed at the bottom of the screen. Click the order reference at the top of the page to return to the order and see that it is partially fulfilled.